Litecoin – denoted by LTC, is an open-sourced blockchain based digital currency which is completely decentralized. 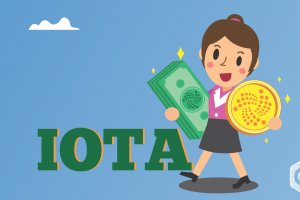 The transactions are not confined to a single server and are available to everyone. Litecoin offers a faster, secure method for transactions and the transaction fees are much lesser compared to the other cryptocurrencies. Information is stored in the ledgers that don’t provide any modification access. Litecoin is a dubbed silver cryptocurrency compared to its equivalent Bitcoin Gold. It works under the proof-of-work consensus algorithm. Litecoin mining can be done using the user’s computers and secure network, and it involves the use of adding blocks to its blockchain. Other than mining, Litecoin can be bought in exchange for Fiat currencies. According to the Coinmarketcap, Litecoin is ranked 4th largest cryptocurrency based on its Mcap value opening at USD 3,639,698,017 on March 26 at 07:34 UTC. LTC traded at $59.62. 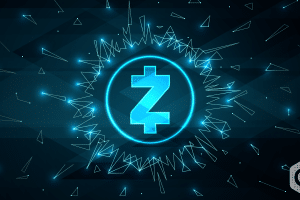 The current MCap value trading at $3,606,063,335 USD (16:24 UTC) is based on the circulating supply of 61,053,086 LTC coins. There is a total supply of 84,000,000 coins. LTC is currently trading at 59.06 USD or 0.01494778 BTC as per stats from coin market cap. 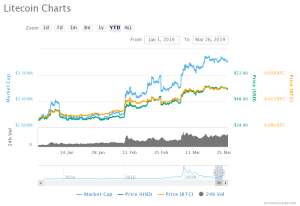 The overall market has been booming since its all-time low on February 08 at 10:34 UTC with the value of USD 2,020,285,697. 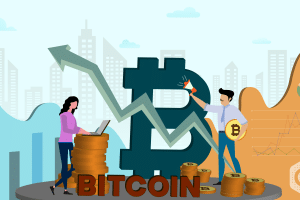 This increasing value led to the cryptocurrency trading at the highest price of $62.09 or 0.01533719 BTC on March 18 at 09:34 UTC. The corresponding MCap value was USD 3,782,936,146 which is higher than the current value by 4.90%. However, the increasing values on the whole with the trading value of $59.06 remains as a proper support resistance. The exponential moving average that calculates the MCAP trend in 20 days backs the market growth with the values increasing from $3,224,846,020 on March 06 at 12:34 UTC to the current value by an increasing percentage of 17.31%. This significant increase gives the bulls an upper hand. 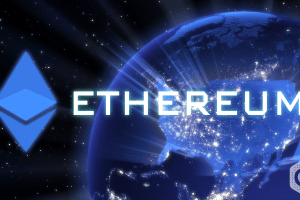 However, the prediction by Finder states that there will be a hike in the trading value of the cryptocurrency by 25% from today’s value. By the end of 2019, 1 LTC would be equivalent to $74. Nonetheless, there are predictions by oracle times and investing PR, that predicts the price per Litecoin might reach $1000 by the end of the year. On a general note, Litecoin has been performing fairly well, taking into account the current analysis from coin market cap. 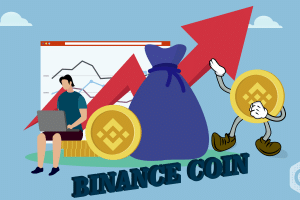 Technical analysis by Coin switch states that there will be a growth in LITECOIN’s market trend and the trading value would increase by 200% reaching the price between $150 – USD 230 by the end of this year, with November touching the pinnacle price of USD 250. This data is based on the halving of the LTC cryptocurrency in August 2019, where the block rewards would be declining by 50%, thus increasing the demand of the currency. 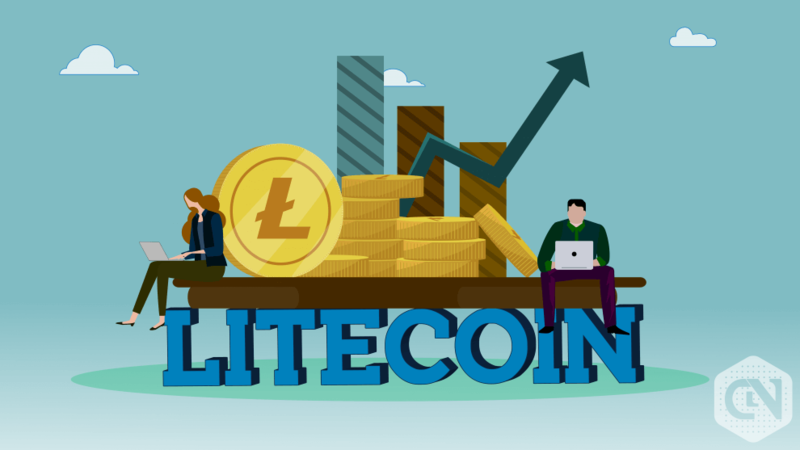 Coming back to the current market of LTC, the current values are in favor of the market growth with the bullish pressure exerted over the market. The comprehensive market of Litecoin, one of the major cryptocurrency, is expected to attract buyers. 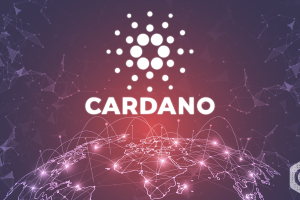 The merchants and the investors, if the predictions are valid, would find this cryptocurrency profitable for a very long period.